Barbecue pork sandwich with hand crafted onion strings. Chili smoked on the EGG tastes amazing on a baked potato with sour cream. Pork Shoulder and hickory smoking wood makes a delicious combination! A simple, yet delicious turkey recipe from Adam Perry Lang. 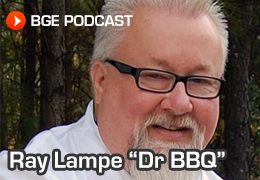 Ray Lampe, Dr. BBQ’s, Beef Brisket Flat on the Big Green Egg. Landshark® Lager Smoked Spanish Chicken by Chef Rusty Hamlin. Dr. BBQ cooks up some chili in the Dutch Oven.